BRONZE AGE - 3500 TO 1200 B.C. 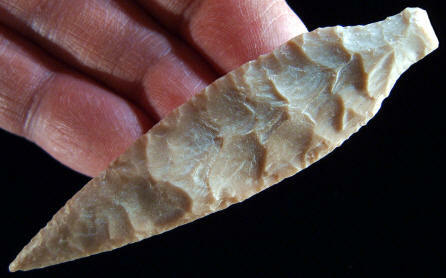 This stemmed arrow point was collected many years ago in Afghanistan. Jim Shaffer, PhD., has identified this point as "based on style, this is probably a Bronze Age point dating to sometime between 3500 and 1200 B.C. This type of point is known mainly from Bronze Age sites in northern Afghanistan." This point is made of good quality brown chert. It measures 3 1/8 inches (7.9 cm) long and 3/16 inch (4 mm) thick.